Richard Olen Sommer II (born February 2, 1978) is an American actor, best known for his portrayal of Harry Crane on the AMC drama series Mad Men. He is also known for his roles in the comedy-drama films The Devil Wears Prada (2006), Celeste and Jesse Forever (2012), The Giant Mechanical Man (2012), and Hello, My Name Is Doris (2015). Sommer was born in Toledo, Ohio, and raised in Stillwater, Minnesota, where he was educated at Oakland Junior High School and Stillwater Area High School. He then went on to attend Concordia College in Moorhead, Minnesota, where he majored in theater and sang in The Concordia Choir. Sommer studied improvisation at the Brave New Workshop in Minneapolis, and started an improv group, the Slush Puppies, in Moorhead. In 2004, he received his Master of Fine Arts in acting from Case Western Reserve University in Cleveland, Ohio. Sommer returned to the school in 2006 to teach icebreakers to law students, and again in 2008 to do an improv workshop with undergraduate theatre students. Sommer's most notable film role to date is as Anne Hathaway's friend Doug in the 2006 film The Devil Wears Prada. He has appeared in commercials for companies such as Bud Light, Dairy Queen, Nextel, and Sprint. From 2007 until its ending in 2015, Sommer maintained a regular role on AMC's period drama series Mad Men as Harry Crane, a media buyer who becomes head of the television department in a 1960s Madison Avenue ad agency. In 2008, Sommer appeared as a guest star in two episodes of NBC's mockumentary sitcom series The Office, portraying the role of Alex. In 2010, he played Jimmy Wilson in a guest appearance on Ugly Betty. In 2011, Sommer guest starred in two episodes of The CW's drama-thriller series Nikita as electrical engineer and CIA consultant Malcolm Mitchell. The following year, he co-starred with Bob Odenkirk and Jenna Fischer in the romantic comedy film The Giant Mechanical Man. In May 2012, he began performances of the Roundabout Theatre Company's production of Harvey on Broadway, co-starring alongside Jim Parsons. Also that same year, he guest starred in NBC's police procedural series Law & Order: Special Victims Unit as Boyd Hartwell. On March 1, 2014, it was reported that Sommer had been cast in the CBS pilot Good Session; however, the network later declined to pick up the project to series. In November 2014, Sommer reprised his role as Harlan Emple in an episode of CBS' procedural drama series Elementary, after guest starring as the character in an episode the previous year. From February 2 to March 13, 2016, Sommer starred in the Off-Broadway revival of Sam Shepard's play Buried Child, with Ed Harris and Amy Madigan. That same year, he also co-starred in Rob Reiner's biopic LBJ as Press Secretary Pierre Salinger, alongside Woody Harrelson in the title role. In 2018, Sommer appeared in the horror mystery film Summer of 84, opposite Graham Verchere, Judah Lewis and Tiera Skovbye. Sommer is a fan favorite on the smash hit podcast, Never Not Funny, hosted by comedian and pioneer Jimmy Pardo. Sommer lives in Los Angeles with his wife, Virginia Donohoe, whom he married on August 13, 2005. They have two children. Sommer is a fan of tabletop games and hosts a podcast about them called CARDBOARD! 2004 Death 4 Told Donnie Segment: "Folklore"
2007 Law & Order Mike Scholl Episode: "Talking Points"
2008 Without a Trace Will Herring Episode: "Article 32"
2009 Law & Order Zach Marshall Episode: "Doped"
2010 Ugly Betty Jimmy Wilson Episode: "Fire and Nice"
2010 Burn Notice Winston Episode: "Friends and Enemies"
2011 CSI: Crime Scene Investigation Scott Horan Episode: "Man Up"
2011 Curb Your Enthusiasm Veterinarian Episode: "Vow of Silence"
2012 Law & Order: Special Victims Unit Boyd Hartwell Episode: "Valentine's Day"
2014 The League Freddie Mandino Episode: "The Beach House"
2015 The Simpsons Young Man (voice) Episode: "My Fare Lady"
2015 Comedy Bang! Bang! Agent Bill Ritz Episode: "Skylar Astin Wears Blue Jeans and Weathered Brown Desert Boots"
2015 Playing House Brian Episode: "Sleepless in Pinebrook"
2016 Last Week Tonight with John Oliver Apple Engineer Episode: "Encryption"
2016 Grey's Anatomy Noah Episode: "At Last"
2016 Adventure Time Grand Prix (voice) Episode: "Daddy-Daughter Card Wars"
^ Divine, Mary (April 24, 2015). "'Mad Men' actor Rich Sommer comes home for Stillwater benefit". TwinCities.com. ^ "Saberi, Sommer to Receive Sent Forth Awards". Concordia College (Moorhead, Minnesota). March 4, 2014. ^ Royce, Graydon (July 27, 2011). "It's a mad, mad, mad weekend for Brave New Workshop". Star Tribune. ^ Washington, Julie (November 25, 2008). "Rich Sommer of 'Mad Men' puts his 'cigarettes' down to help out at Case Western Reserve University / Cleveland Play House graduate program". Cleveland.com. ^ Ausiello, Michael (January 16, 2010). "'Ugly Betty' exclusive: 'Mad' man Rich Sommer woos Betty". Entertainment Weekly. Retrieved March 27, 2012. ^ Masters, Megan (March 16, 2011). "Nikita Scoop: Mad Man Infiltrates Division!". TVLine. ^ Fernandez, Jay A (June 12, 2010). "Three Actors Cast in 'The Giant Mechanical Man' Romantic Comedy". The Hollywood Reporter. ^ Leeds, Sarene (April 26, 2012). "'Mad Men' Actor Rich Sommer: 'Harry's Not a Douchebag'". Rolling Stone. ^ Stanhope, Kate (April 17, 2012). "Exclusive SVU Video: Chloe Sevigny Gets "Sociopathic" as a Self-Destructive Housewife". TV Guide. ^ Andreeva, Nellie (March 1, 2014). "Rich Sommer Cast In CBS Pilot 'Good Session'; Brian Howe In 'Save the Date'". Deadline Hollywood. ^ Abrams, Natalie (July 31, 2014). 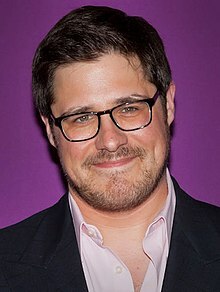 "Exclusive: Mad Men's Rich Sommer Returning to Elementary". TV Guide. ^ Clemet, Olivia (December 3, 2015). ""Mad Men" Star Rich Sommer Joins Cast of Upcoming Off-Broadway Revival of Sam Shepard's Buried Child". Playbill. ^ Lincoln, Ross A (September 21, 2015). "Allison Tolman, Michaela Watkins Join Will Ferrell-Amy Poehler Comedy; LBJ Packs Cast As Production Starts". Deadline Hollywood. ^ Squires, John (2017-07-12). ""Mad Men" and "Riverdale" Stars Head Back to the 'Summer of '84'". Bloody Disgusting. Retrieved 2018-12-06. ^ Farley, Christopher John (March 19, 2012). "A Mad Man on the Loose". The Wall Street Journal. ^ Michaud, Sarah (September 2, 2010). "Rich Sommer Welcomes Son Patrick Ryan". People. Retrieved March 27, 2012. ^ Maxwell, Erin (December 17, 2007). "Satellite Award winners announced". Variety. ^ Stark, Chelsea (December 1, 2016). "The Game Awards: Here's the full winners list". Polygon. Wikimedia Commons has media related to Rich Sommer.